Andy Robson is a guitarist, vocalist, songwriter and multi-instrumentalist from Berlin, Germany. He is mostly seen fronting one of various band projects he is involved with. His main focus lies on his grooving Blues Rock band ANDY ROBSON & URBAN FOX. He can also be seen singing at the piano on stage with the “Andy Robson Band”. A stylistically diverse musician, his great passion is the Blues and Blues-Rock. The influence of Funk, R&B and Classic Rock can easily be heard in his soulful playing and singing in a style he himself simply calls “Roots Music”.Listening to his strong and passionate voice, his earthy and bluesy solo-playing and his groovy and funky rhythm-playing you can hear right away what he’s about. All this makes Andy Robson one of the very few german musicians of his generation who is really able to play and perform this kind of music authentically at the highest level. Indeed he continues the tradition of American Roots Music, while at the same time giving it his own personal touch. 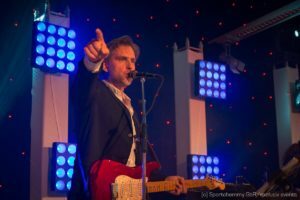 Rooted in the Blues Andy has also shown over the years that he is an extraordinary performer of sophisticated pop songs, oldies and classics. Also, if he needs to he can even turn his hand to chill-out lounge and Jazz music. No matter what the venue, and whatever kind of stage. Be it a music festival or a small club, you always feel his deep love of music, his class and his musical prowess. Andy is playing intensively with his two bands ANDY ROBSON & URBAN FOX and the ANDY ROBSON BAND as well as appearing as guest musician in various international line-ups. Andy Robson works as guitar teacher and composer and is also involved as musician and coach for various social youth projects.